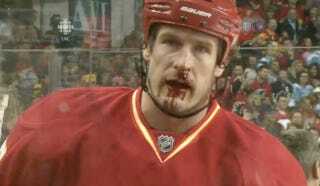 Presenting Tim Jackman, of the Calgary Flames, from last night's season-opener against the Pittsburgh Penguins. Jackman didn't score any points in the Flames's 5-3 loss, but he did serve a two-minute minor for too many men on the ice. H/T to tipster Noah D., who reports "Jackman actually went in for a hit on Arron Asham and got a high-stick to the face. No penalty." Highlight of the hit 10 seconds into this video.